Visions West Productions specialises in High Definition Wedding Video Services so we have partnered with Rick Bentley Photography to bring you both services in one package. Wedding Photography is a key element to any wedding celebration, and choosing a photographer should not be taken lightly. Visions West Productions put our trust into Rick Bentley Photography and are proud to work alongside such a skilled and talented photographer to complement our video services. Rick Bentley is a professional and experienced photographer who specialises in weddings, Rick has a talent for capturing all the special moments into breath-taking photos. Partnering with Visions West we are proud to bring you the ‘Gold Package’: Complete Video and Photography services for your special day. We are currently working to deliver you the DIAMOND PACKAGE. Together with Rick Bentley Photography and carefully selected Hair Dressers, Makeup Artists and Celebrants we can provide you the total wedding package without the hassle of chasing individual providers. We expect to launch this package in the third quarter 2014. Covers the bride getting ready, hair/make up, grooms place (depending on distance) Before and after the bride is dressed, including bridesmaids. 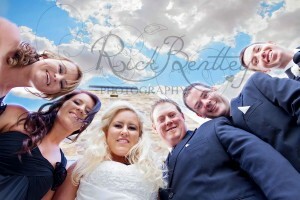 Photos before wedding, during ceremony, family photos and unlimited locations. Mock & real cutting of cake, & reception. Photographs of guests at tables. Visit Rick’s website to see a selection of gallery photos and full information on all Rick’s services. Rick Bentley Photography.